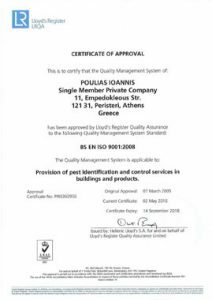 Poulias Ioannis SMPL company is the leading – greek pest control company which is certified with Quality System EN ISO 9002:1994 since 1998. In 2005 our Quality System was updated to ISO 9001:2000. 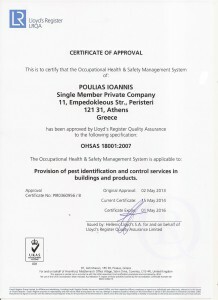 Quality Assurance Manager is Mrs Panagiota Chrysanthopoulou – Chemist. 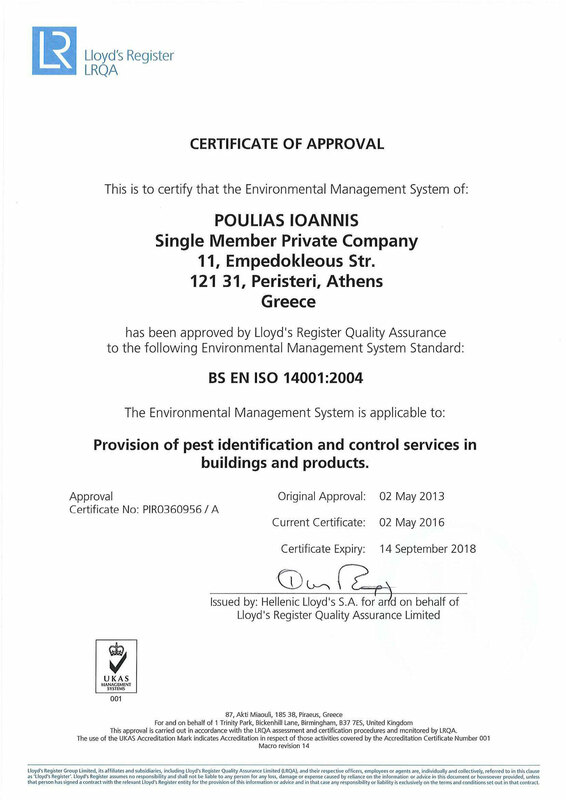 With respect to the environment, our company successfully applies Environmental Management System and it is certified with BS EN ISO 14001:2004 for the Environment. The safety and Hygiene is a top priority for us. 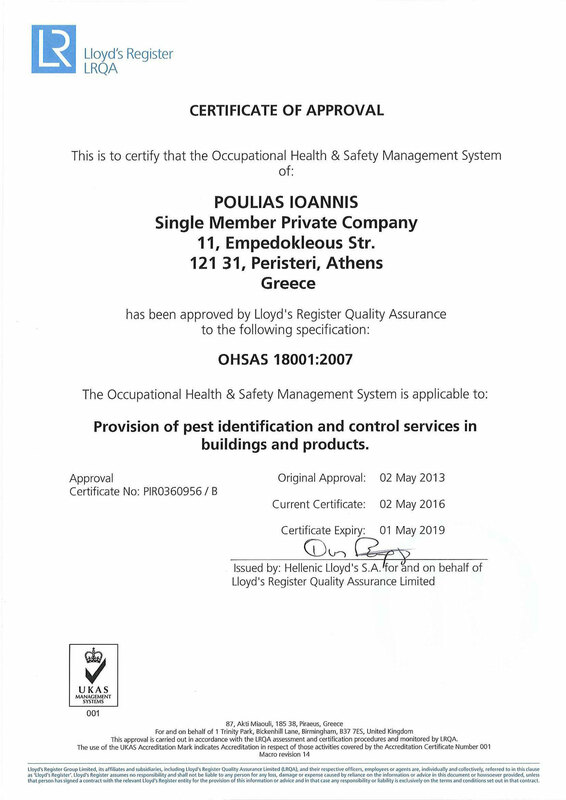 We pay great attention to safety measures and regulations in our work that is why our company is certified with the Health & Safety at Work Management System OHSAS 18001:2007. 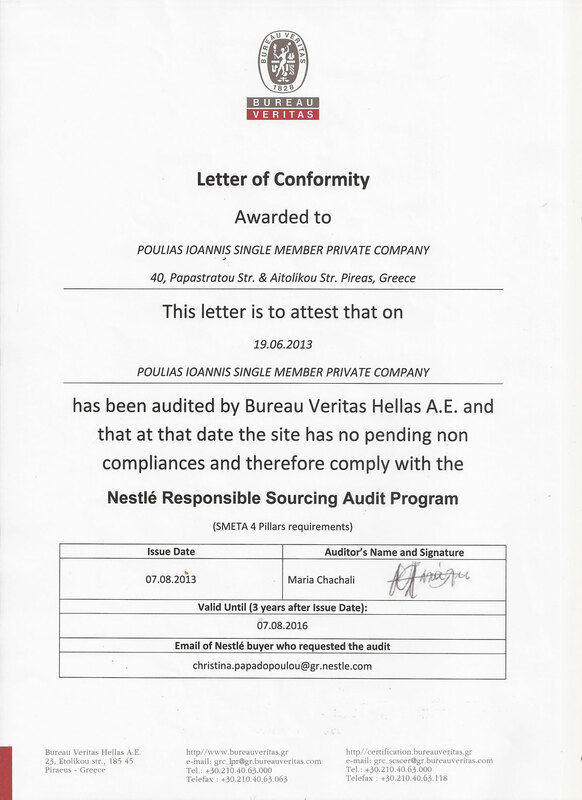 For our compliance with the rules, our company has received the LETTER OF CONFORMITY, upon inspection of Bureau Veritas Hellas S.A. 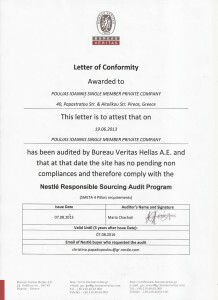 This inspection was requested by NESTLE HELLAS S.A., in order for our company to comply with the requirements of the « Nestle Responsible Sourcing Audit Program». 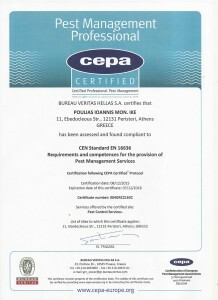 We are very proud for being one of the first European companies to receive the signal CEPA CERTIFIED. 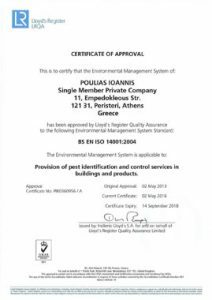 This mark certifies that our company fulfills the requirements of the pest control management, as defined in European standard EN 16636. Basic parameters of the model is the environmental protection, minimization of the risks posed by use of insecticides and rodenticides, skills and knowledge required for the professionals involved in the pest control field. 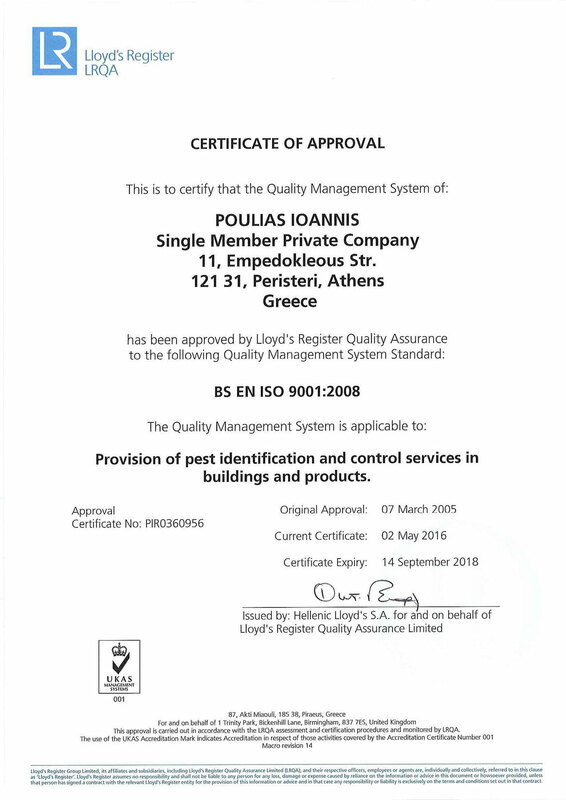 The standard EN 16636, which defines the acceptable professional context of the pest control companies, was created on the initiative and actions of the CEPA, the European federation of national associations of pest control companies (Confederation of European Pest Management Associations). The CEPA represents a dynamic sector which involves over 10.000 companies throughout Europe, with more than 40.000 employees and an annual turnover of more than 3 billion euros. 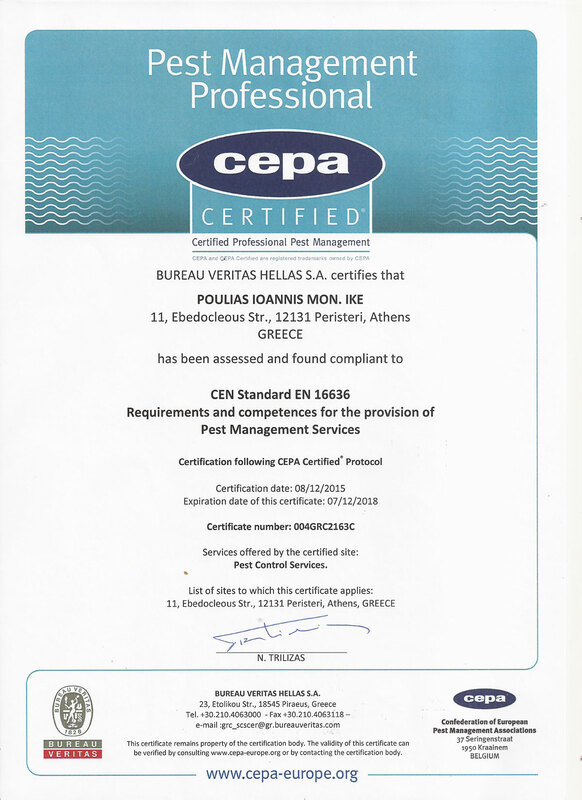 Member of CEPA, is the Greek Association of Pest Control Companies (SEAME), whose founding member and member of the Board is our Company. Click images to see the certificates.